The most reliable source for preparing for the EXADEP™ Test – The Official EXADEP™ Test Study Guide is created by ETS, the maker of the test. It is jam-packed with information to help you do your best on test day. You can be confident that this guide contains the most up-to-date information regarding the EXADEP Test and will help put you on the path towards earning your graduate degree. The paperback version of this book can be ordered through the ETS Puerto Rico Office. 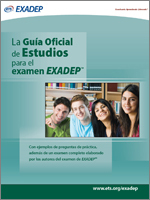 Visit https://www.ets.org/es/exadep/test_prep/study_guide (Spanish) or https://www.ets.org/exadep/test_prep/study_guide (English). eBooks are an on-demand, environmentally friendly alternative to hard-copy study guides and practice tests. You can download them as easy-to-use PDF’s, immediately upon purchase. Your eBook will be personalized with your name and order number, to show you are the purchasing customer. It is for your proprietary use only. Our eBooks can be viewed on virtually any device, as long as you have the free Adobe® Reader Software.